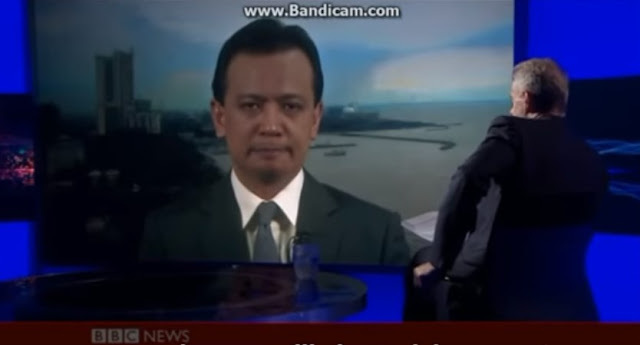 I want to write Stephen Sackur (Stephen Sackur) and thank him profusely for exposing how ignorant, malicious, and stupid Antonio "Sonny" Trillanes IV is in this hard hitting interview. PLEASE MAKE THIS GO VIRAL. PLEASE WRITE STEPHEN SACKUR, THAT RARE WHITE REPORTER WHO GETS IT, TOTALLY GETS IT, AND THANK HIM. Stephen Sackur, there is NO Duterte propaganda machine. We are a motley crew of patriotic, hopeful Filipinos who see Duterte's vision and appreciates it. We know what real life is like and understand Duterte's management and leadership style. Trillanes just can't handle the fact that his OWN propaganda machine against Duterte is not working! They have poured so much money to run it to no avail. Trillanes is nothing but a contemptible power hungry stupid and passe politician whose career is over, and who is only doing what he is doing as payment for political favors. He is a puppet and a lapdog of the oligarchs. Thank you Stephen for demolishing Trillanes! The Filipino heart sings. Despite Trillanes' claims, the BBC host seemed to be more knowledgeable about the real and current developments in the Philippines. Si Trillanes, nagmukhang ugok just like what he really is. The streets are safer now, here in the Philippines we needed a ruler with an iron fist.. I'm just wondering whether your comment which are constantly negative are OUT OF TUNE with ordinary Filipino opinion."